Kanelstrand: Planning a Childbirth: Is There a Comfort Zone and Should You Get Out of It? Planning a Childbirth: Is There a Comfort Zone and Should You Get Out of It? For most mothers childbirth is one of the most painful things they will ever experience. Staying relaxed and comfortable is sometimes the best hope for making the experience as quick and as tolerable as possible. Of course other factors come into play as well. Proper nourishment throughout pregnancy is essential. But when it comes to a comfort zone in planning a birth, is there such a thing at all? If there is a comfort zone, should you stay in it? Is your mental comfort zone the same as your physical comfort zone, does it make a difference for the birthing process? Moira less than 24 hours old. I remember 2 childbirth stories from my mom when I was growing up. The first was that when my mother was in the hospital in labor with my older sister, my mother's 3 child, the doctor was nowhere to be found. My mother was in the hospital bed, and the nurse's solution to the missing doctor was to tell my mother not to push and try to prevent the baby from coming out before the doctor came in. Did my mom really need that doctor or the nurse? The second story I remember her telling me was that she was in labor with me at home, but her labor stopped when she checked into the hospital. I think that is a common place for labor to stop or slow down upon arrival to the hospital. I have to wonder if this is the body's natural response to being in an unfamiliar place surrounded by strangers. When I was pregnant with my first daughter, I wanted an OB/GYN doctor. I hadn't done any research. It was what I felt comfortable with based on what I had learned from society. My only experience with childbirth was limited to witnessing a very traumatic hospital forceps birth. My husband wanted a home birth. I tried to keep an open mind. I purchased a few books, the best of which was The Thinking Woman's Guide to a Better Birth by medical writer Henci Goer. After reading this book I learned that intervention can more often than not harm rather than help during the child birth process. I decided to hire a midwife. I got comfortable with that. I think that there is no such thing as a mental comfort zone for a woman in her first pregnancy. Nothing can prepare you for the experience. You really don't know what to expect. I took support in online forums for pregnant women. I even learned that (wow) there were women giving birth at home without the help of a midwife. I tried to get comfortable with the midwife, but as time progressed it just wasn't going to work out with her. Both my husband and I had a bad feeling about her and her behavior. Just like doctors, not all midwifes are created equal. I recall later thinking how brilliant one of my friends was to find out transfer statistics from home to hospital for the midwife she hired for her 2nd birth. With 3 weeks left before my due date and low funds I collected the birth kit from the midwife and found myself truly out of my comfort zone and planning for an unassisted childbirth. My husband had complete confidence in our ability to have the baby at home. Luckily I had a friend with experience in unassisted childbirth who also was confident and encouraging. I was young, I was healthy. I had eaten well. I was athletic. I had herbal remedies up my sleeve from Susun Weed's book The Child Bearing Year and a back ground in Chinese herbal medicine and acupuncture. The day before I went into labor, I watched my pregnant cat hide herself in my dark quiet closet. She gave birth at home in private. Could birth be that simple? When my labor started I thought I was in terrible pain, but in retrospect I think that my mental distress contributed to the pain or at least the length of time I had to endure the pain. I had the comforts of my home: my own bed, a giant clawfoot bathtub with hot water, windows open or closed as I wished, privacy, teas, juices. I relished the soup I had made before hard labor began. It gave me physical strength to continue on. But these comforts didn't help me with my mental distress. My mind was occupied with questions "Is this normal," "Is it supposed to be this painful?" "Do I need to call the fire department?" "Is it too late for an epidural or c-section?" My husband assured me it was supposed to be painful and all was well, but what did he know?, I thought. Later my friend Cricket (an experienced mom), who was camping out on my porch, told me she could tell everything was okay, by the sound of things. After 8 hours of labor, I broke down and did what I didn't realized I had been avoiding. I squatted. It felt like something tore in my pelvis when I did it. But that was the movement I needed to make. And so quickly there was progress. With very little effort my 7 pound daughter's head was out, so soon that my husband was still in the kitchen making me lemonade. A few years later I watched the film, The Business of Being Born. I laughed and was so happy to see that I was not the only one crying for a c-section during home birth. The midwife having her first birth at home in that film was in much worse shape than I was. The experience of birth doesn't end with the birth itself. How wonderful to be finished with the birth, put the baby down in her own bed, take a bath and go to sleep in my own bed. I was grateful for simple comforts of home after such an ordeal. 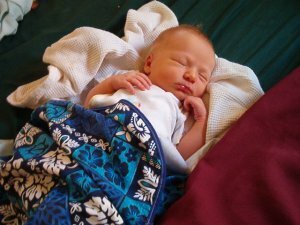 Six years after my first unassisted home birth I found myself planning a second. With a 'been there done that' attitude, I didn't see much point in hiring a doctor or midwife. Having had the experience of a successful unassisted homebirth, I couldn't imagine having anyone else involved in the process or leaving the comfort of my home. My comfort zone was now 100% at home both mentally and physically. However having lost my athletic physique, the pregnancy was not quite so easy. I didn't give up. I took a lot bed rest as was necessary for issues that came up. I watched Oceans 11, 12, and 13 a bunch of times while on bed rest, and read a lot of good literature. When I went into labor I put on the movie Oceans 13. By the time I got to Al Pacino's line "I don't want the labor pain, I just want the baby!" I rolled my eyes. I had That was my cue to get in the hot bath. How grateful I was that it wasn't my cue to get in a car and go to a hospital. 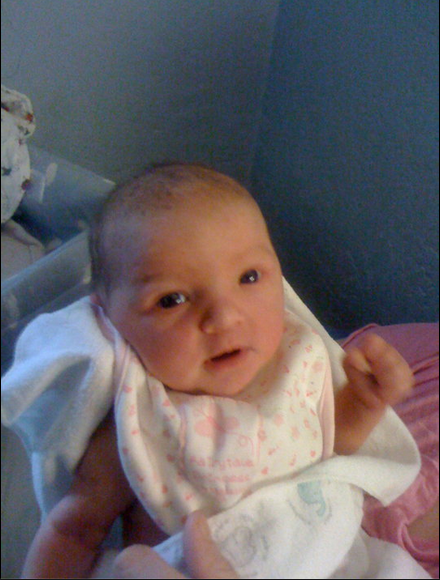 Tessa less than 24 hours old. Labor was much more painful with my second birth, but I did not have the mental anxiety that I had with the first. I knew it was going to be painful. I knew I just had to get though the pain. After only 5 hours of labor I gave birth to an 8.5 pound baby. Unlike with my first daughter, it was a real struggle to find a position in which I could push her out. I had to stand. My husband was there and (wow) just like in the movies this time he (had to?) tell me to push. She did not come out easily. He told me that her head was turned slightly to the side. She also came out with a broken umbilical cord. Thankfully the placenta came out soon after. It is very uncommon for a cord to break during birth from what I understand. It makes me wonder if she was tangled in it and I would not have been allowed to give birth to her naturally in a hospital. Do you have experience with birth in a hospital, with a midwife, unassisted? Do you have a mental comfort zone when it comes to birth? Is it different than your physical comfort zone? Do you think getting out of your comfort zone applies when it comes to planning a birth? Copyright 2013 Cory Trusty All rights reserved.